There are many references in the Bible that talk about angels and how they relate to God's people. In Psalm 91:11 we read that God commands His angels to take care of us. In Hebrews 1:14 angels are called ministering servants to the heirs of salvation. 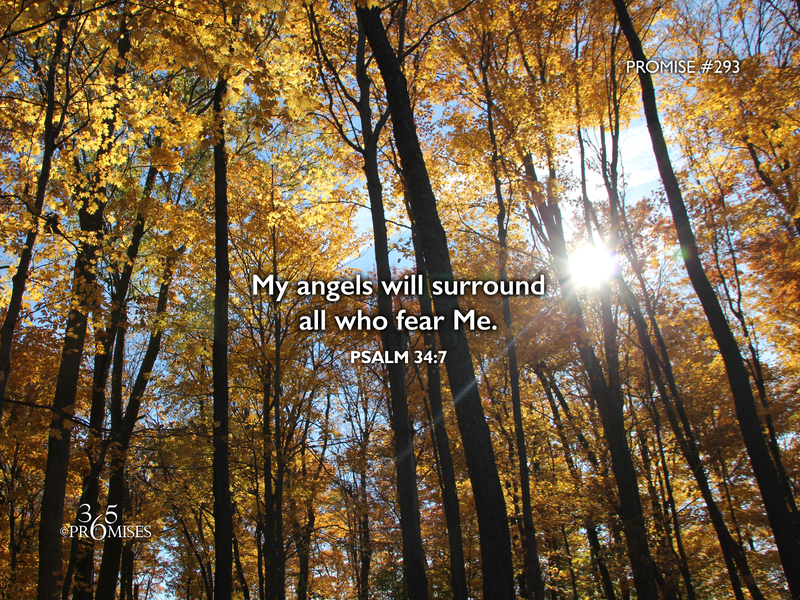 In today's promise from Psalm 34:7, we read that the angel of the Lord actually camps around those who fear Him. I don't know about you, but I don't think of angels that often. I know they are real and I know that they are involved in our daily lives. I choose to focus on Jesus, the author and perfecter of my salvation and on growing in my relationship with my heavenly Dad through the very active work of His Spirit. But today, I want to encourage you, that God has sent His angels to minister to us and to protect us because we are His heirs. Just because we can't see angels, doesn't mean that they are not close by. And the reason why they are there and active on our behalf is because we belong to God and are His kids. The presence of angels surrounding each one of us, is simply a token of our Father's affection. What an amazing thought! The angel of the Lord surrounds you and me!